Angola Peace Monitor produced every month by ACTSA - Action for Southern Africa, the successor organisation to the British Anti-Apartheid Movement. Angola Resources part of Karen Fung's "Africa South of the Sahara Electronic Guide". After being a US-backed rebellion for decades in Angola, the National Union for the Total Independence of Angola, or UNITA, is now struggling as a political entity. UNITA was created in 1966 by former MPLA member Jonas Savimbi, to fight Portugal, which ruled Angola as a colony. After independence was won in 1975, the liberation parties started to fight each other for power, in a Cold War proxy war, pitting the U.S. backed-UNITA against the MPLA, supported by the former Soviet Union and Cuba. In 2002, the MPLA eventually won by killing Savimbi. Three main military movements had fought for Angolan independence since the 1960s. The Popular Movement for the Liberation of Angola (MPLA) was a Marxist organization centered in the capital, Luanda, and led by Agostinho Neto. The National Front for the Liberation of Angola (FNLA), led by Holden Roberto, was based in the north of the country and had strong ties to the U.S. ally, Mobutu Sese Seko, in neighboring Zaire. The National Union for the Total Independence of Angola (UNITA), an offshoot of the FNLA, was led by Jonas Savimbi and supported by the country’s largest ethnic group, the Ovimbundu. Following the Portuguese coup, these three revolutionaries met with representatives of the new Portuguese Government in January 1975 and signed the Alvor Agreement that granted Angolan independence and provided for a three-way power sharing government. However, trust quickly broke down among the three groups, and the country descended into civil war as each vied for sole power. During the Cold War the U.S.-backed anti-Communist forces of UNITA were engaged in opposition to the Angolan government, which received support from Cuban troops. The Union for the Total Independence of Angola (UNITA) rebel movement controlled various portions of Angolan territory over differing lengths of time. Although UNITA lacked educated cadres and arms, it attracted the largest following of the three movements from the Ovimbundu, who comprised 31 percent of the population. The Ovimbundu lived in the parts of the country in which the diamond mines were found, and next to oil, diamonds were the most valuable resource in Angola. The richest areas were under UNITA control, and provided them with the necessary means to maintain their war machine. UNITA first came to international attention when, in December 1966, a group of its guerrillas attacked the town of Teixeira de Sousa (renamed Luau), succeeding in interrupting the Benguela Railway and stopping Zambian and Zairian copper shipments for a week. The new organization was formed by Jonas Savimbi, the former foreign minister and main representative of the Ovimbundu within the Revolutionary Government of Angola in Exile (Govêrno Revolucionário de Angola no Exílo--GRAE), whose disagreements over policy issues led to Savimbi's resignation in July 1964. Savimbi had traveled to China in 1965, where he and several of his followers received four months of military training and became disciples of Maoism. Perhaps the strongest impact of Maoism on UNITA has been Savimbi's insistence on self-sufficiency and maintenance of the organization's leadership within Angolan borders. 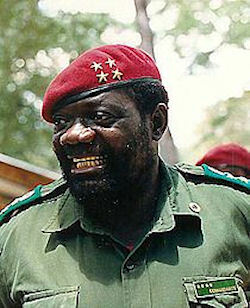 Upon his return to Angola in 1966, Savimbi turned down an invitation from the Popular Movement for the Liberation of Angola [MPLA] to join its organization as a rank-and-file member and moved UNITA into the bush, where the organization began its guerrilla war with a small amount of Chinese military aid transported via Tanzania and Zambia. Unlike the MPLA and FNLA, UNITA enjoyed the benefits of a unified and unchallenged leadership directed by Savimbi. Moreover, in contrast to the mestiço-dominated, urban-based MPLA, Savimbi presented UNITA as the representative of black peasants. UNITA's constitution proclaimed that the movement would strive for a government proportionally representative of all ethnic groups, clans, and classes. His Maoist-oriented philosophy led Savimbi to concentrate on raising the political consciousness of the peasants, most of whom were illiterate and widely dispersed. Savimbi preached selfreliance and founded cooperatives for food production and village self-defense units. He set up a pyramidal structure of elected councils grouping up to sixteen villages that--at least in theory-- articulated demands through a political commissar to a central committee, whose thirty-five members were to be chosen every four years at a congress. On the eve of independence, UNITA controlled many of the rich, food-producing central and southern provinces and was therefore able to regulate the flow of food to the rest of the country. At the time, it had solid support in rural areas and among the Ovimbundu, Savimbi’s ethnic group, which accounted for some 40 percent of the population. Civil war errupted soon after independence, and for nine years Cuban and MPLA troops failed to inflict a serious reverse on UNITA, which until 1985 had been increasingly successful in the field. UNITA in the 1980s was a state within a state. Under the leadership of Jonas Savimbi, it survived defeat during the civil war, retreated to the remote southeastern corner of the country, regrouped and made its headquarters at Jamba, and launched a determined campaign to overturn the MPLA-PT regime or at least force it to accept UNITA in a coalition government (see fig. 16). With increasing international support and military aid, particularly from South Africa and, after 1985, the United States, UNITA extended its campaign of destruction throughout the entire country. It enlarged its military forces and scope of operations and withstood several major FAPLA offenses. Starting with a small army of a few thousand defeated and poorly armed followers at the end of 1976, Savimbi built a credible political organization and fighting force. Unlike what became of the MPLA under its faction-ridden leadership, UNITA remained the creation and vehicle of its founder. Internal opposition occasionally surfaced, but the lack of independent reporting made it difficult to assess its significance. South Africa kept FAPLA and Cuban forces at bay and intervened whenever FAPLA offenses threatened, leaving UNITA comparatively free to consolidate its control throughout the south and to extend its range of operations northward. In February 1988, Savimbi announced the formation of a UNITA government in "Free Angola," the area he controlled. Although his intent was to regularize administration, rather than to secede or seek international recognition, this event marked a new stage in UNITA's organizational development and consolidation, and many Africans states maintained at least informal ties to the movement. By mid-1991, after more than 15 years of civil war the ruling MPLA, UNITA, and an array of smaller political parties were preparing to campaign for Angola’s first multiparty national election to be held late next year. The MPLA’s control of the government, balanced against UNITA leader Savimbi’s charisma and his party’s solid rural and ethnic base, promises a close, hard-fought match between the two top contenders. UNITA was gradually making the change from guerrilla group to political party. UNITA was not spared some problems under the new system. A movement that developed a rigid and centralized system of ruling to fight a long war under very harsh conditions was not well suited to an open political system. UNITA meant everything to its rank-and-file; it ensured their survival by feeding and protecting them, and provided guiding principles by giving a sense of purpose to their lives. After being subjected to the discipline of a single party for sixteen years, it was not easy for the rank-and-file of UNITA to adapt to the open electoral contest and to many of the characteristics of a democratic political life. UNITA leaders feared they will lose the hold they have on their soldiers once they are exposed to urban lifestyles. Peace seemed imminent in 1992 when Angola held national elections, but the historic elections were at once peaceful and violent, free and threatened, successful and irrelevant. The two days of elections, September 29 and 30, were relatively peaceful, and hailed by UNAVEM and other international observers as free and fair. In the presidential race, dos Santos won with 49% over Savimbi's 33% of votes cast. In the parliamentary vote, the MPLA won an unexpectedly large 55% to UNITA's 35%. Before the election results were even announced, Savimbi angrily accused the MPLA of fraud and threatened to renew the civil war. A week before the elections, Savimbi ominously told a British television crew that, "if I lose, then the elections were rigged and I will send my men back to the bush to fight again. We will not accept defeat." Fighting picked up again in 1993. In 1997, under the Lusaka Protocol, UNITA was urged to seat its seventy representatives elected in 1992. Not wanting to risk the lives of UNITA's key leaders, such as Lukamba Gato, Samuel Chiwale, and Adalberto da Costa Junior, by sending them into the then MPLA-controlled Luanda to take up their National Assembly seats, the party president, Jonas Savimbi, substituted sixteen party leaders from below the elected cutoff of the electoral list to become UNITA,s parliamentarians. The end of Angola's long and bloody civil war followed the death of rebel leader Jonas Savimbi in a shoot-out with government troops. 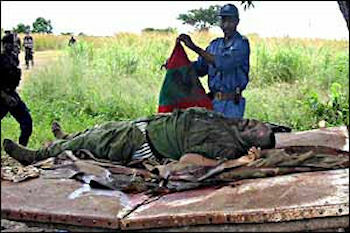 In late February 2002, Jonas Savimbi was shot dead by the Angolan government troops. Following this, a ceasefire was signed weeks later between the government and UNITA rebels. The parliament also approved an amnesty for rebels deciding to surrender. UNITA officially disbanded its military forces. Five-thousand UNITA soldiers were to be integrated into the Angolan armed forces, and most of the rest are supposed to be returning to civilian life. Some 100,000 adult combatants from UNITA moved with their families into quartering areas. Five thousand of these were integrated into the national police and armed forces; the rest into a formal demobilization program. Most adult fighters eighteen and older received demobilization and photo identification cards, a travel authorization certificate, a five-month salary based on military rank, and food assistance. They were also to receive a transport allowance and a reinstallation kit upon return to their home communities. But boy and girl soldiers, seventeen and younger, were not included in the demobilization program and received only an identification card and food aid distributed by the international community to family units attached to the soldiers. No official figures existed for how many children fought with UNITA and the government in the last resumption of the war from the period 1998 to 2002. The Coalition to Stop the Use of Child Soldiers estimated that 7,000 children served with UNITA and government forces, Angola Armed Forces (Forças Armadas Angolanas, FAA). Child protection workers in Angola suggested that as many as 11,000 from the two sides may have lived and worked in combat conditions. Some children received weapons and arms training and were active in the fighting. Many others acted as porters, cooks, and spies. Girls served with UNITA as domestics, assistants, and “wives” to soldiers. Women and girls were also forcibly given as “comfort women” to visiting guests in UNITA-held areas in the war. The process of demobilizing UNITA guerrillas in Angola was essentially complete by October 2002, and the task was now to help the rebels and their families re-integrate into civilian life. Virtually the entire rebel force, an estimated 82,000 fighters, were in the more than 30 cantonment camps around the country. An estimated quarter-million dependents of UNITA members are in the camps with the de-commissioned fighters. UNITA decided to become a peaceful political party. Its members elected Isais Samakuva to take over the party leadership, and engaged in the demobilization and re-integration of their army. This transition was not made without trouble, and relations with the ruling party are still difficult. When Isaias Samakuva replaced Savimbi as UNITA President, some found the new UNITA leader professorial, almost pedantic, in responding to questions. Samakuva, who at times was immaculately attired in suits that obviously had not been tailored in Africa, was quite articulate in English. Nonetheless, Samakuva lacked the fire and inspiration that were the trademarks of Savimbi. Samakuva did not come across as a natural leader inspiring popular support. Since there had been no elections since 1992, members of the National Assembly have only changed due to personal resignations, retirements, or deaths. In these instances, the party was allowed to select the replacement with the concurrence of the National Assembly's Ethics Commission. Upon assuming the presidency of UNITA in 2003, Isaias Samukuva announced his plans to strengthen UNITA's position in Parliament by replacing the sixteen parliamentarians with key members who had stayed by Savimbi's side in the bush or traveled on diplomatic missions overseas during the final years of the civil war. While these sixteen deputies represented UNITA through a challenging time from 1998 until 2002, they are valued for having shown up to work in enemy territory, not for contributions as UNITA parliamentarians. The decision was approved and ratified by UNITA's Permanent Commission in July 2004. Left with the choice to back down or insist on replacing the parliamentarians, Samakuva chose the latter and on February 6, 2006, suspended the sixteen parliamentarians, pending UNITA's governing council's final decision. On February 15, 2006, the President of the National Union for the Total Independence of Angola (UNITA), Isaias Samakuva, announced that if the substitution of UNITA's sixteen parliamentarians was not allowed, UNITA, Angola's largest opposition party, may pull out of the Angolan Government of Unity and National Reconciliation (GURN) and the National Assembly. UNITA's twelve cabinet positions and seventy members of parliament would then have to resign from their positions in support of UNITA, form a new political party, or become independent and, in the case of the Cabinet members, face possible replacement by President dos Santos. Incumbent UNITA President Isaias Samakuva trounced rival Abel Chivukuvuku in the party elections held on 19 July 2007. In an electoral process designed to position UNITA as the only party prepared to bring transparency and democracy to Angola, the 1,076 delegates to UNITA's 10th Party Congress voted by an overwhelming margin to re-elect incumbent party president Isaias Samakuva for a second four year term. Though the race was labeled too close to call at the outset, internal political maneuvering by the incumbent Samakuva's campaign ensured his victory before the Congress' opening session. The results notwithstanding, it's too early to discount the younger and more charismatic Chivukuvuku from moving into the party leadership at a later date. The young, urbane and charismatic Chivukuvuku seemed the stronger candidate when the campaign started, but in the end didn't resonate with delegates. Insiders pointed out that many delegates were "old-school UNITA" members who were older, rural, and often not well-educated. This group remains resistant to change and fiercely loyal to Savimbi's memory; Samakuva was seen as peacefully carrying Savimbi's legacy, whereas Chivukuvuku has been known to criticize the party founder's actions. Some party officials, led by Abel Chivukuvuku, left UNITA and created a new organization, the Convergence of Angolan Salvation [Casa]. UNITA's attempt to distance itself from the Government of National Unity and appeal to young and independent voters was also noteworthy. On 14 November 2007, UNITA Party President Isaias Samakuva delivered a rousing, wide-ranging speech to kick off UNITA's 2008 electoral cycle. Poverty, argued Samakuva, threatens national security and should be reduced through education, health, housing, employment and justice. Samakuva proposed spending as much on education as Angola has on military reform, with 12 years of compulsory education, new school curricula, information technology in education, and higher salaries for teachers. Job placement centers and regional salary differentials will attract employees where their work was needed while vocational training increases the number of skilled workers. Samakuva said UNITA would reduce the number of civil servants and reform the civil and military service, to provide job security, decent wages and adequate pensions. Revising existing laws on national security, preventive detention, and criminal investigation should be the first step to creating an independent judiciary, according to the UNITA leader. In the election in 2008, the ruling People's Movement for the Liberation of Angola, or MPLA, won more than 80 percent of the vote and 191 of 220 legislative seats. UNITA won only 16 seats. UNITA and 12 other opposition parties campaigned on the need for change after three decades of MPLA rule. These were the second multi-party elections in Angolan history and the first since a peace accord, six years earlier, ended 27 years of civil war mainly between UNITA and the MPLA. In September 2012, election results in Angola showed the party of President Jose Eduardo dos Santos sweeping to an easy victory. Angola's election commission said with most of the votes counted, the Popular Movement for the Liberation of Angola had 72 percent of the vote. The leading opposition party, UNITA, won 18 percent. The new opposition Casa party of Abel Chivukuvuku received five and a half percent. UNITA claims that the current elections are rigged, but unlike in 1992, elections during which the party rekindled the war, a call for violent action was now definitely off-the-table.